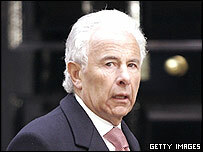 Lord Levy, 61, denies any wrongdoing and accused the police of using their arrest powers "totally unnecessarily". The peer was one of the key figures in the securing of multi-million pound loans to the Labour Party last year. Police are examining whether honours were ever given as reward for financial help to any of the three main parties. Critics of Mr Blair have seized on news of the arrest as Lord Levy is a close ally and tennis partner of the prime minister, as well as his Middle East envoy. Scottish National Party leader Alex Salmond claimed the water was now "lapping around the prime minister's feet". Scotland Yard is conducting a wide-ranging investigation into loans and donations made to all three parties to see if there is any evidence that honours have been given as rewards for financial help. It follows the revelation earlier this year that multi-million pound loans were secretly given to Labour before the last election. Analysis: How bad for Blair? A police spokesman confirmed a man had been arrested and questioned about possible infringements of honours and election laws. Lord Levy's spokesman said: "He has not been charged and does not expect to be, as he has committed no offence." The peer has been bailed pending further inquiries. His spokesman added: "Lord Levy has made it clear that he is ready at all times to co-operate with the police investigation. "He therefore complied with a request to attend today at a police station where the police used their arrest powers, totally unnecessarily, apparently in order to gain access to documents that Lord Levy would quite willingly have provided without this device." The prime minister's official spokesman said he could not comment on Lord Levy's arrest because it was a party, not a government, matter. Some of the lenders were subsequently nominated for peerages by Tony Blair. Lord Levy's arrest comes two days after it was alleged he told a businessman he did not have to tell a Lords vetting committee about his loan to the party. BBC political editor Nick Robinson says the fate of Lord Levy and Mr Blair is "intertwined". "This could not be more serious for Tony Blair personally," he says. Former Home Secretary David Blunkett said critics of Mr Blair would take a particular attitude but others would wait until the police had finished their work. "Let's ask the Metropolitan Police to do the job quickly and thoroughly and without theatricality," Mr Blunkett told BBC News 24. A Labour spokesman said the party "has and will continue to co-operate fully with this police investigation and, because of the ongoing nature of the investigation, we will not be commenting further". Labour MP Tony Wright, chairman of the public administration committee, said Lord Levy and others in the spotlight had volunteered to give evidence publicly. He said that suggested they thought they were "in the clear". Just how big a political bombshell is Lord Levy's arrest? Angus MacNeil, the Scottish National Party MP who initiated the police inquiry, called for a freeze on all future honours until the investigation was completed. "This is a significant development and one that would appear to justify my decision to report this matter to the police," he said. Shadow home secretary David Davis said Lord Levy's arrest demonstrates "that the police are taking the cash-for-peerages question very seriously". He added: "I want this issue cleared up once and for all in British politics." Liberal Democrat MP Norman Baker said: "It is ludicrous for the prime minister to refuse to comment on the basis that this is a party matter. Is Tony Blair not leader of the Labour Party?" Lord Levy made his money in the 1960s and 1970s, managing singers including Alvin Stardust and Chris Rea.